Had a great day at the Spring ASIS International security conference. I have an article published in the current edition of Security Director Magazine (the picture is me pointing to my article)! To read the article, Inclusion – Powerful in the Workplace or Just More Words, in full click here and scroll to page 55. Enjoy other great articles in this security magazine. 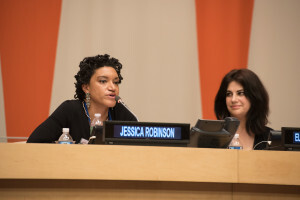 Jessica Robinson, is a writer and Founder & CEO of PurePoint International. She has worked with a top 40 company and with the 2015 US Open. As a security & risk management expert and outsourced CSO (Chief Security Officer), she advises and consults with small and medium sized businesses on cyber prevention and response. Learn more at www.the-purepoint.com. I was honored and thankful to speak at the ACEDS Conference. It was a wonderful opportunity to learn the deeper security challenges to companies and to share my insights of working with small and medium sized businesses in bridging the gap between physical & cyber concerns. 1. Almost 80% data breaches arise from internal staff – train your staff. 2. Law firms have to be part of the cyber solution. (i.e, Panama Papers). Know the threat landscape for your industry. 3. How are you collaborating with internal and externals partners (IT, Managing Director, computer forensics experts, and other stakeholders). Stay tuned for my upcoming article detailing what law firms need to know to prevent breaches. I was honored to volunteer with a group of high school students and to be on a Microsoft DigiGirlz Panel with incredible women who started their own company from Women In Technology, to leaders at Microsoft & Bloomberg discussing girls and tech with high school students across the New York City. It was great to look out and see a sea of young girls interested in careers in tech! For young women and experienced this is both an extremely invigorating, yet nerve wrecking place to be when few resemble and look like you. I love having the opportunity of sharing my experience of starting out as a computer science major to now owning my own company. It has been a winding road with twists and turns like many other people I know. Life has been anything, but predictable and I enjoy being part of the movement of men and women to move the needle on these statistics. I was honored to speak at the United Nations, Power of Collaboration Conference with IMPACT Leadership 21 with Ambassador Flores of Honduras, and Ambassador Chowdhury, former UN Ambassador from Bangladesh. My life’s work, mission, vision and soul purpose is in advancing peace and security for ALL human beings. It was an honor to share my insight on the featured panel Conversations With Men: Accelerating the Role of Women in Peace, Safety, and Security for Sustainable Economies. I was able to champion for safety, security and equal participation of women globally for women who, perhaps, have not yet found their voice or are not in a position to influence the actions of private sector or political leaders.This panel specifically asked for insights from men on how to help advance the role of women globally, so it was an honor to be on the panel. My call to action for all men was to tell your daughter, sister, niece, wife, friend, that you support equal participation and self determination for her and her continued existence in this world.